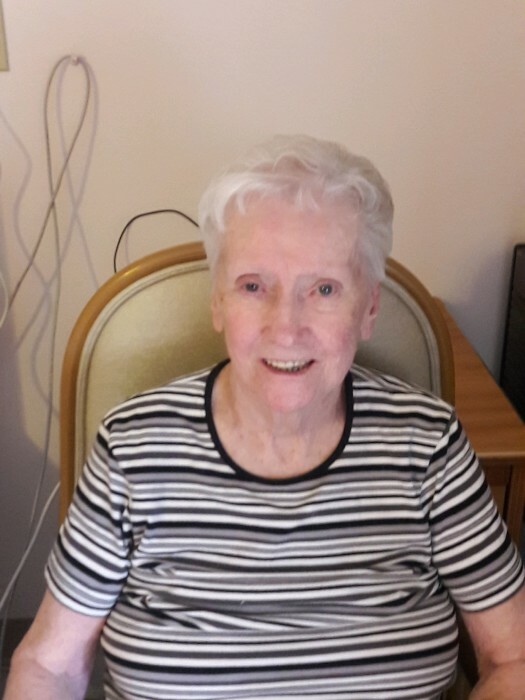 Joan M. McCarren (Mansfield), age 89, of Braintree, passed away peacefully on Monday, April 15, 2019. Mrs. McCarren was the loving and supportive wife of the late Robert J. McCarren. She was completely devoted to her children; Mary Quinlan of Marblehead, Patricia Kelly of Braintree, Georgina Lambert of Westboro, John of Millis, James of Stoughton, David of FL and the late Bobby and Michael McCarren. She was the sister of Marie Kelly of Jamaica Plain and the late Jean Murphy, Jack, David, and Joseph Mansfield. Mrs. McCarren was lovingly survived by her 11 grandchildren and 4 great grandchildren. She will be missed immensely by so many. Visiting hours will be held at the Alfred D. Thomas Funeral Home, 326 Granite Ave., Milton, Sunday, April 21, 2019 from 4 to 8 PM. A Funeral Mass will be celebrated at St. Pius X Church, 101 Wolcott Rd., Milton, Monday morning, April 22, 2019 at 10 am. Burial will follow in Knollwood Memorial Park, Canton. Donations may be made in her memory to The Martin Richard Foundation, 1452 Dorchester Ave., 4th Floor, Dorchester, MA 02122.